Current testing procedures take days. This is almost instant. Thirty-five people got sick from E. coli-infected romaine lettuce this past month before the Center for Disease Control (CDC) knew where the greens were from. In total, 75 individuals were hospitalized and one death was recorded in connection with the outbreak. Now, the CDC is advising the public avoid lettuce from Yuma, Arizona. It’s somewhat simple to avoid an outbreak once the source has been identified. However, what if the farmers never sent out infected produce to begin with? A new foodborne-illness detection technology out of Purdue University is looking to help with just that. The device hooks up to smart phones and lets growers test their foods for bacteria in a matter of minutes. So how exactly does Purdue’s preventative detection process work? First, the produce is sloshed around in solution full of phages, a virus for bacteria. 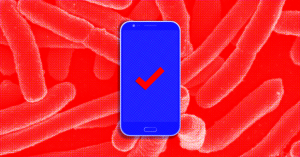 An extra chemical in the water lights up infected e. Coli, and a phone’s camera can pick up on the glowing bacteria if it’s present. This sounds complex, but the system is actually faster than current testing procedures, which can take days. While Purdue is working to ensure infected foods don’t make it to market in the first place, other researchers are trying to minimize the damage done once the product hits stores. OwlTing, a start-up founded in 2013, wants to use blockchain technology to track every step food producers make. Their goal is to have shoppers pick up a food, scan a sticker with their phone, and see how food was treated (i.e. with what chemicals), where it was grown or processed, and when it all happened. This record can help identify which products belong to a batch that could be contaminated. Customers can dodge options that will get them sick, and grocers can sell safe batches they otherwise would have preventatively tossed. Purdue and OwlTing can help producers and buyers make better-informed decisions. But when it comes to public health agencies confirming outbreaks, even they admit that better communication is key. After a 2013 salmonella incident, the CDC said their federal and state agencies could have shared their research with one another more efficiently. Further, not all their staff was trained on the laws surrounding informing the public. If we don’t get better at that last key step, we’ll always have that one friend who didn’t learn about a food recall until it was too late. But hopefully, with this new tech at our fingertips, we can avoid foodborne illness before it reaches our plates. You Know That Romaine-Linked Outbreak? DNA Tech Is Fixing It.